Learn about 941 payment being made at the same time as the 941 Form. Payments are accepted during processing of the Federal 941 quarterly return. The payment must be under $2500.00 to be made at the same time as the 941 Form. If the payment amount exceeds the $2500.00 limit, the payment must be filed separately by using the Federal Tax Deposit Coupon (EFTPS/8109V) Form. Note: If the amount due on the 941 Form is over $2500.00, the message above will appear to you. Learn about fraction of cents on the 941 and how to calculate it. Read more if the software allows you to use old forms. Learn more about what you need to do for correcting 941 forms. 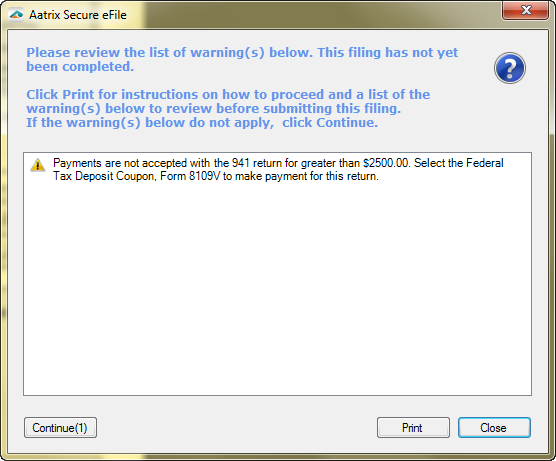 Learn which page printing format is accepted by IRS.